We set a goal to capture the same mystic musical quality from the middle eastern musical heritage as represented in ‘Voices of Israel’ and ‘Desert Voice’. The Turkish clarinet is the ideal supplement to the aforementioned; a very versatile and vocalic melody instrument that reflects the microtonal system. The beautiful and mystic character of this sound will capture the imagination of your audience and take them on a 1001 nights journey or fly them through a land of fables and myths in a way that is unmatched in any other woodwind performance sample collection. Within this collection we offer a full range of tempi ranging from 40 BPM to 180 BMP and a collection of melodic phrases in every western harmonic key from A to G#. Our proven effective and convincing technique of merging highly professional and authentic performances into a flexible and user friendly instrument has brought us to the development of “Shahrazad”. 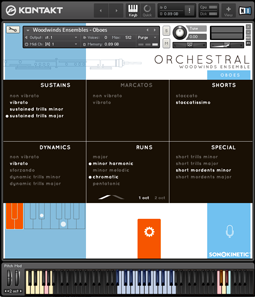 The musical quality in these melodic phrases is impossible to recreate with conventional multi sampled woodwinds. Especially microtonal transitions and lyrical passages will only sound convincing when performed live by a professionally trained and authentically schooled musician. 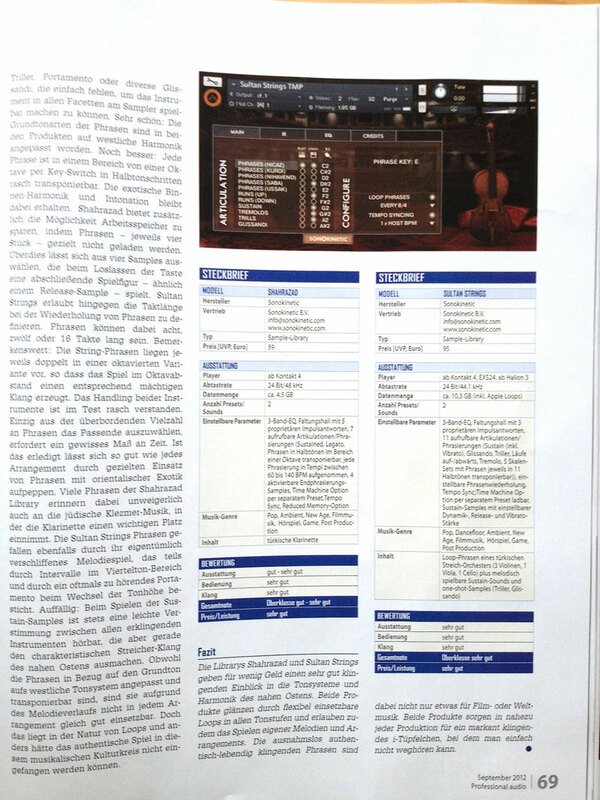 Therefore we went a long way to find the most suitable performer for this collection of performances samples. Nevertheless we also decided to invest in multi sampling, to provide the composer with all essential tools to create an original and fitting musical section into their music productions. Therefor you’ll find an authentic legato scripted multi samples section in this sample library. We are proud to announce and release the next level in the Sonokinetic musical heritage collection. 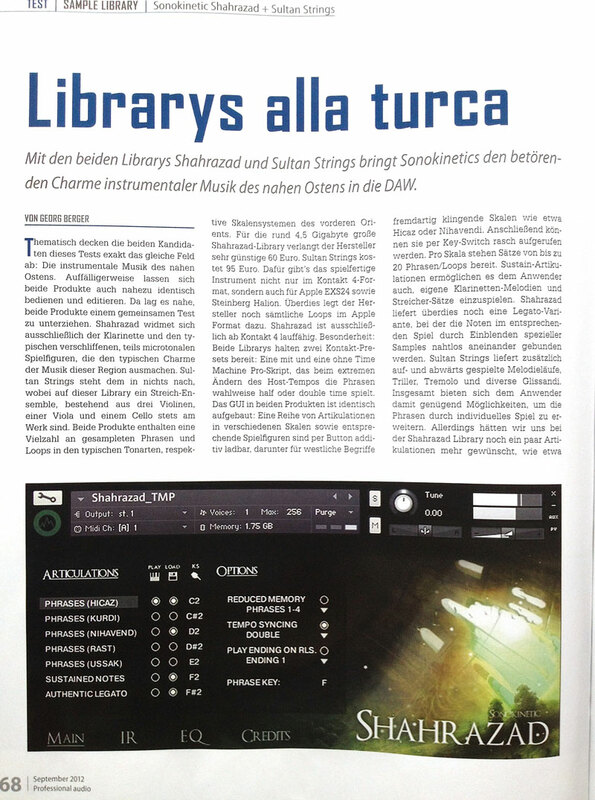 With “Shahrazad” we believe to provide the composer with a new and original musical context and language. 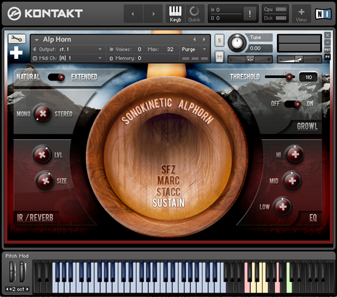 Express yourself in new creative and authentic music textures that appeal to your imagination and creativity. This musical idiom is a perfect style to fit your fables, myths and fantasy scores. Remember Rivendell and Lothlórien or the depths of the unexplored Sherwoods. 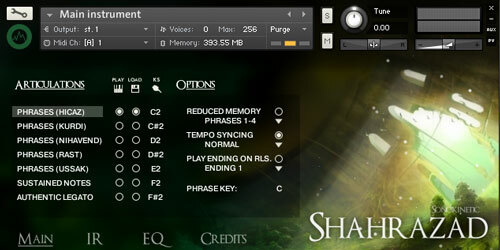 With “Shahrazad” the composer will find instant satisfaction. Since we composed and performed generic and consistent phrases this entire collection can be easily combined to create countless new variations on melodic passages. Throw in our Authentic Legato instrument and merge your own composing talent with the performances and the options are infinite. 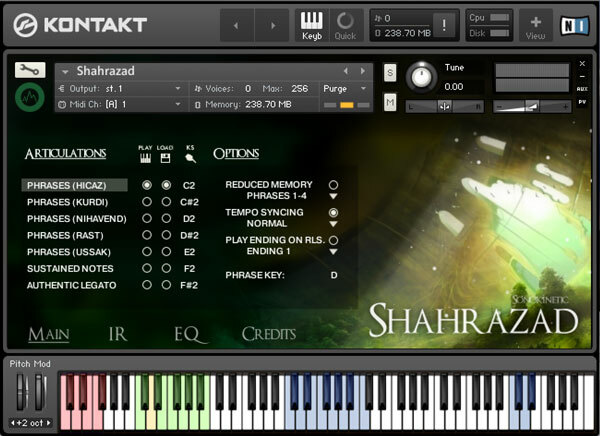 For your convenience, Shahrazad contains all the articulations you could ever need in a single NKI instrument. You can switch between the different playing styles either by clicking its name from the MAIN panel, or by pressing its respective keyswitch on your MIDI controller. Shahrazad contains recorded phrases in BPMs between 60 and 140. By default, the instrument will pick the closest BPM to your sequencer’s current tempo. 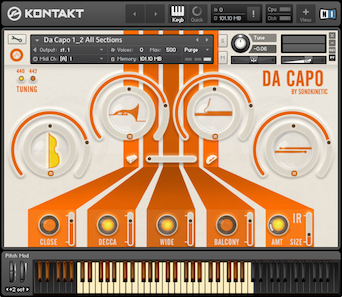 The instrument uses Kontakt’s ability to synchronize samples to your sequencer’s tempo. You can configure this aspect on the right of the instrument’s main panel. REDUCED MEMORY allows you to only load specific phrases required into memory to reduce the load on your system. You can select batches of 4 phrases using the drop-down. 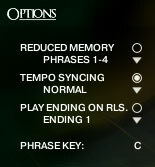 TEMPO SYNCING enables and disables the synchronization script. When it is disabled, you can pick a custom BPM using the drop down underneath. NORMAL allows you to configure how the tempo syncing scales to your sequencer’s BPM. For example, HALF will result in a run being half your sequencer’s tempo while DOUBLE results in it being double. If you pick a specific BPM from the list the phrase of this BPM will be used and synchronized. 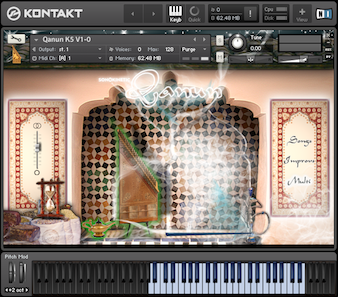 PLAY ENDING ON RLS Allows you to instruct the instrument to play a note-ending sample when you release the key. There are 4 available per makam that can be selected from the drop-down menu. LEGATO: Authentic legato instrument with recorded intervals and scripting. articulations not used to save memory. clicking the key label and pressing a key on your keyboard while it is flashing. NORMAL: Allows you to configure how the tempo syncing scales to your sequencer’s BPM. It can be changed by clicking.